Brooklyn Nets forward Kris Humphries is one of the very few athletes known more for his activities off the court, than what he may have ever accomplished on the hardwood. Now in his ninth NBA season, the University of Minnesota alum has produced a decent NBA career, averaging 6.7 points and 5.6 rebounds per game. Last season was Humphries best as a professional, when the big man totaled 13.8 points and 11 rebounds per contest. His 2011-2012 effort earned him a new two-year/$24 million contract from the relocated Brooklyn franchise. Off the court, it is no secret that Humphries is considerably more recognized for his very public relationship with reality TV icon Kim Kardashian. The brief “love affair” came to an abrupt conclusion, when on October 21, 2011, it was announced that the couple's “fairy tale” 72-day marriage was over. Or, so we thought. On December 1, 2011, Humphries filed for an annulment and separation from Kardashian. But, it was recently reported that since the separation action has not been fully granted, the hoops player may still be on the financial hook for Kardashian's newly publicized pregnancy, fathered by none other than Kanye West. No matter how hard he tries, the 6-9 Net cannot seem to break away from the Kardashian family. One has to wonder if Humphries wishes he could have just continued living the life of a solid, well compensated NBA player. A existence void of the humiliation and scorn his reality show dalliance has now provided him. 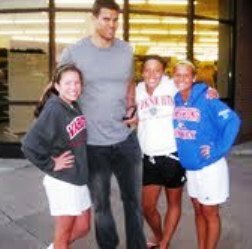 Above is an original photo of Humphries, recently submitted to iFolloSports.com. The picture was captured last summer, outside the Champp's Americana restaurant in Minnetonka, Minnesota. Humphries grew up in Minnetonka and resides on the shores of Lake Minnetonka (home located in the city of Mound), during the offseason. After experiencing such a tumultuous stretch of Kardashian-induced pain, this photo of Humphries seems to reflect a calm and peaceful summer by the lake. This season, Humphries is averaging 7.0 PPG and 7.1 RPG, for the underachieving, but now streaking Brooklyn squad. Fans can catch a further glimpse of Humphries, via this iFolloSports.com original video clip, caputured outside the Montage Beverly Hills hotel in November.